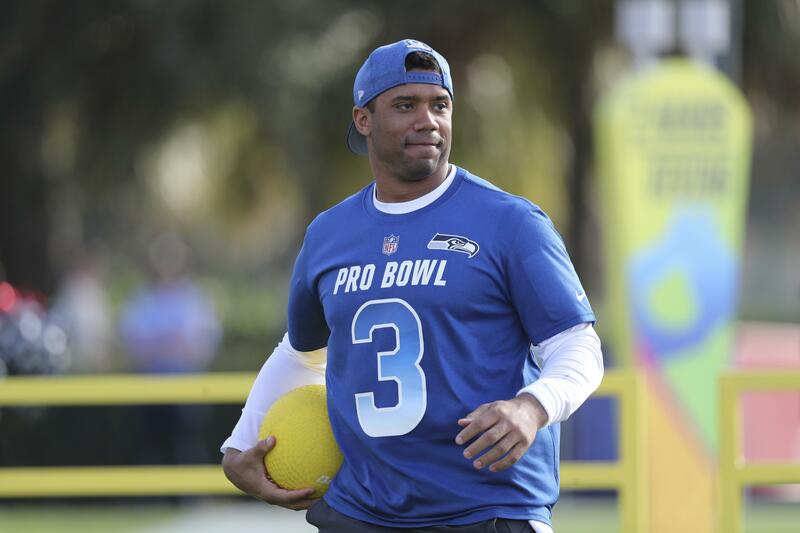 SEATTLE – The Pro Bowl isn’t where any of the Seahawks wanted to be playing Sunday. But that’s what Russell Wilson, Bobby Wagner and Michael Dickson are left with – representing Seattle in Sunday’s annual exhibition of, well, something that sort of resembles NFL football. While everyone realizes the league’s annual all-star game is becoming more of touch-football fest each year – though really, who wants to see anyone come close to getting hurt? – a lot of people still watch. Last year’s game drew a 5.3 national rating, the highest national rating in 2018 for any of the major pro sport all-star games, and 8.8 in Seattle, the fourth highest of any TV market in the country for the Pro Bowl. That means a lot of you are inevitably going to be watching when the game kicks off at noon whether you really wanted to or not. So even if you didn’t think you’d need it, here are seven things to know about the Pro Bowl. 1. Wilson is going for a little Pro Bowl history: OK, so this isn’t the kind of NFL history Wilson cares much about. But every year that he continues to play in the game – this season marks his sixth invite and fourth appearance – he has a chance to become only the second player in NFL history to be named an MVP of the game twice. Wilson won it in 2016 when he was named as the offensive MVP, with then-Seattle teammate Michael Bennett winning defensive honors that same year. Former Oakland QB Rich Gannon, who was the MVP in 2001 and 2002, back when usually only one player was honored, is the only player in NFL history to be named a Pro Bowl MVP twice. So there’s at least some incentive for not sleeping this week. 2. This is the fewest number of Seahawks in the game since 2010: Dickson and Wagner were named to the game in the initial selections. Wilson was added later as a replacement for the injured Aaron Rodgers. Seattle had a handful of other alternates – such as running back Chris Carson, receiver Tyler Lockett and defensive end Frank Clark – but none was ultimately called on. That leaves Seattle with just three in the game, the fewest since none made it in Pete Carroll’s first year as coach in 2010. Since then Seattle had had at least five in every season (either as initial invites or added later) including a record-tying seven each of the past four years. Just another “chip on the shoulder” to play with in 2019. 3. If you’re mad about that, blame everybody: As a reminder, the teams are picked in what is a split vote of fans, players and coaches, all accounting for one-third of the total. There are 44 players initially picked to each team, which is fewer than the 53 on a regular NFL in-season roster and the 46 of an active gameday roster. 4. Maybe don’t expect to see Dickson a whole lot: Seahawks fans might be excited at the prospect of seeing Dickson in action – he was the first rookie punter named to the Pro Bowl since 1985 and the first Seahawk since 1994 when Rick Tuten became the only Seahawk punter to make it before Dickson (so you lose out if you thought maybe Dave Finzer or Vince Gamache had at some point received the call). But who really wants to see punting in an all-star game? No one appeared to want to last year as each coach took advantage of the meaningless of it all to basically go for it on every fourth down – each team was 1 for 3 – which meant there was only one punt in the game (a 60-yarder by Bothell High alum-turned Ram Johnny Hekker). 5. Maybe this will be Wagner’s year to shine: The year that Bennett won MVP honors in 2016 Wagner was the leading tackler in the game with 10. That’s one of just two times Wagner has appeared in the game – he happily skipped 2014 along with the other six Seattle players named to the game to instead play in the Super Bowl and sat out last year with a hamstring injury. Despite all he’s accomplished, Wagner might still not be quite the national household name he’d like to be and there are worse bets out there than thinking Wagner will do what he can to heighten his profile Sunday. 6. Yes, Seattle once hosted a Pro Bowl: The Pro Bowl this year is in Orlando, Florida, where it has been since 2017, held at Camping World Stadium (fun fact – the stadium was also used in the movie “The Waterboy” and in the old TV show “Coach,” each of which may have featured more competitive football than you’ll see Sunday). But there was a time when the game moved around some, and Seattle hosted the 1977 game, granted the contest along with being given entry into the league in 1976 (fellow expansion partner Tampa Bay also got a game then), making Seattle one of 15 cities to host a Pro Bowl. It was an affair chock full of Chucks – the coaches were Chuck Knox (then with the Rams, a few years before he made the Kingdome his home stadium as coach of the Seahawks) and Chuck Noll of the Steelers with Chuck Heberling as the head referee. Pittsburgh cornerback Mel Blount, who in the kind of thing that would never happen today, played despite an ankle injury suffered in practice and won MVP honors with two interceptions as the AFC beat the NFC in front of 63,214. 7. And yes, they get paid for it: In fact, the money provides at least something of a motivating factor as the members of the winning team in the Pro Bowl each receive $67,000 while the losers get $34,000. That winner’s share is more than half the participants in the Super Bowl will get – the winners of the Super Bowl each get $118,000, the losers $59,000. Players who are named to the Pro Bowl initially (meaning, not injury replacements such as Wilson) also may earn incentives if they are written into their contracts (neither Wagner nor Dickson are reported to have any). Published: Jan. 25, 2019, 3:04 p.m. Updated: Jan. 25, 2019, 10:18 p.m.